<da:thum <da:thumb id=" Mature Content 679728852">b id="676322818"
I think you did a pretty good job portraying him! Is that in the background? is it possible, to have this as a poster? Oh wow yeah this is wonderful! Gosh I do indeed like your style here! Oh dear ! The beautiful guy! Where is the Fan fiction ? Oh no. The meme is coming to life. 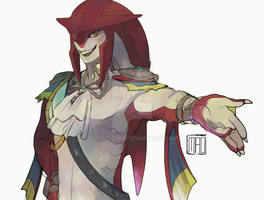 Link in his boxers, standing by Sidon. My handsome fish son. LOL This is so amazing! I wanna draw hiiiim \^0^/ You should do another Anthro some time! They are a lot of cute characters and yes drawing no nose is interesting! The fishy is hot. Hot fishy.